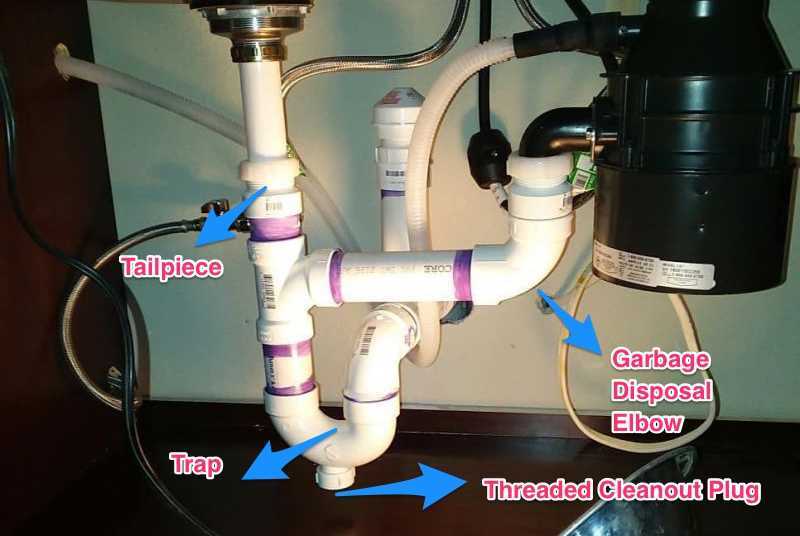 Garbage Disposal Backing up into Your Other Sink? Here's the Fix! There’s nothing more annoying than having your garbage disposal back up into the other sink. Not only does this stink and spread germs, it’s also quite a hassle as well. Calling a professional to fix your sink can cost a lot of money. Before you do this, utilize the tips below and see if you can work out the problem yourself. In the end, you just might save yourself some cash. There are several possible reasons why your garbage disposal is backing up into your sink. Some of these reasons can include overuse, a clog in the drain lines, or even installation problems. Whatever the reason, if you follow the steps listed below, you’ll get your garbage disposal working in no time. In the other sink, the one opposite to the garbage disposal, start by filling it up with water. You’ll want to add 3 to 4 inches of water. Make sure you don’t add more than that. If you do, use a cup to take some out and pour it into the bucket. Next, you’ll want to plug the other sink, the side with the garbage disposal. Take your sink plunger, place it over the plug, and start to work the plunger up and down. If you don’t feel the suction, then you’re doing it wrong. If that’s the case, simply reapply your plunger over the drain plug. It’s also important to note that you’ll want to make sure you’re using a sink plunger and not a toilet plunger. These are two different tools with two different shapes. After you have worked the plunger several times, remove the plug in the sink with the garbage disposal, turn on the facet, and let cold water run down the drain. If the clog still hasn’t cleared, you’ll want to repeat the process. This time, work the plunger a little longer, and again, unplug the drain and turn on the facet back on. If the clog still hasn’t been removed, the clog is probably much further down the pipe than you imagined. Once the clog is down that far, plunging just isn’t effective. Once you have removed this plug, carefully take off the elbow-shaped pipe. If you’re unsure which pipe this is, it’s the one that connects the garbage disposal to the drain. If you realize that this pipe is not where the clog is, re-attach it. Next, locate the tailpiece and take it off. The tailpiece is the component that is hooked to the sink drain. You’ll also want to fully clean the tailpiece before you re-attach it. If the tailpiece is not the issue, you’ll want to go ahead and remove the trap. The trap is connected to the main drain pipe. You’ll now want to get your plumber’s snake and begin working it into the main drainpipe. It’s important to note that this is the pipe that’s connected to the back wall. When you’re pushing the snake down the drainpipe, you’ll want to crank the handle of the device, and make sure you turn it clockwise. You should start to feel some resistance. Keep cranking the handle until you remove the clog. One the clog has been removed, clean your snake off with water or a towel. Put everything back together including the trap, the plug, the elbow, and the tailpiece. You’ll also want to make sure the threaded plug is tight. Lastly, turn on the facet and run hot water down both drains. This will clean them both and remove any debris still left in there. Both your drains should be working fairly well now. It’s also important to note that you never stick your fingers in the garbage disposal to try and remove the blockage. This could lead to serious tragedy. If you’re still having problems, it’s probably best to call a professional. More than likely, the clog is further down pipe and will need special tools to get the clog removed. On the other hand, you might also have some installation issues too. For more information on this, read the Installation Problems section below. Installation problems could also be the reason why your garbage disposal is backing up into your other sink. 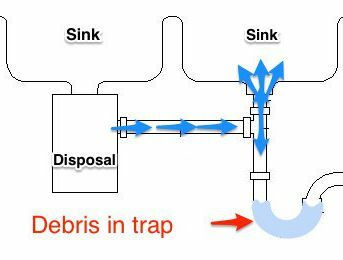 Both the garbage disposal and the sink basin will have their own separate trap. 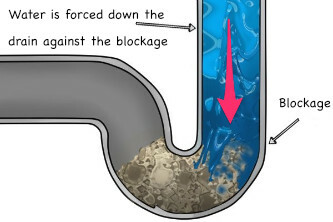 Usually, both of these traps are both connected to the main drain line that goes into the wall. Together, they are Y-shaped. Now, with some systems, the garbage disposal is connected to the tailpiece of the other sink. With this system, the pipes make a T-shape. The problem with this setup is that sometimes the water can be pushed up into the sink opposite of the garbage disposal causing a clog. You can however buy a specialized T-piece made to direct the flowing water downward. If you’re experiencing clogs on a regular basis, it’s best to install a Y-shaped system instead. The best way to prevent your garbage disposal from backing up into the other sink is to take preventable measures. Preventable measures will not only save you time and money, they’ll also help keep your garbage disposal and drain in good working condition. So, what are these preventable measures? First, be careful what you put down your drain and grind up. Some scraps can clog your drain and freeze the blades of your garbage disposal. Things you should not grind up include coffee grounds, rice, pasta, potato skins, apple peels, orange peels, bones, and egg shells. In addition to this, never pour grease down your drain. The grease can begin to clump up and form blockages or even jam up the blades of the garbage disposal. Another tip for keeping your garbage disposal from backing up into the other sink is regular cleaning. By pouring a little dish soap down the drain and running cold water from the facet for about 15 minutes from time to time, you can keep the gears and the blades of your garbage disposal working well. By doing this, you help prevent the build-up corrosion, rust, and grime. Even if you don’t use your garbage disposal very often, you’ll still want to run cold water down the drain while running your unit from time to time. To keep your pipes clean, take a cup of baking soda and a cup of vinegar and pour them down the drain. Start with the baking soda, and then pour the vinegar down after it. This little trick will help you keep them clean. Grease and other particles can clog up a pipe overtime, but by doing this from time to time, you can really save yourself a lot of trouble in the future. To keep your blades sharp, take a few ice cubes and grind them up. You’ll want to do this every now and then. How does this help? Grinding ice cubes will help sharpen the blades of your garbage disposal and keep them cutting well. If your blades are dull, the motor will have to work harder to grind up the scraps and will ultimately have a shorter life span. Another reason why it’s good to grind up ice cubes is because doing this can also help breakdown the build-up of grease in hard to reach areas. Overtime, grease can start to build-up and lead to problems down the line. This is why keeping your garbage disposal clean is important. The last tip for avoiding blockages is to never throw trash down the garbage disposal. This includes hair, cigarette butts, twist ties, plant clippings, utensils, pull tags, and rubber bands. Even if you think it’s not a big deal, just don’t do it. It’s easier to throw the item in your garbage can. Not only will you keep your garbage disposal working well, you’ll also save yourself a lot of time, money, and effort too. 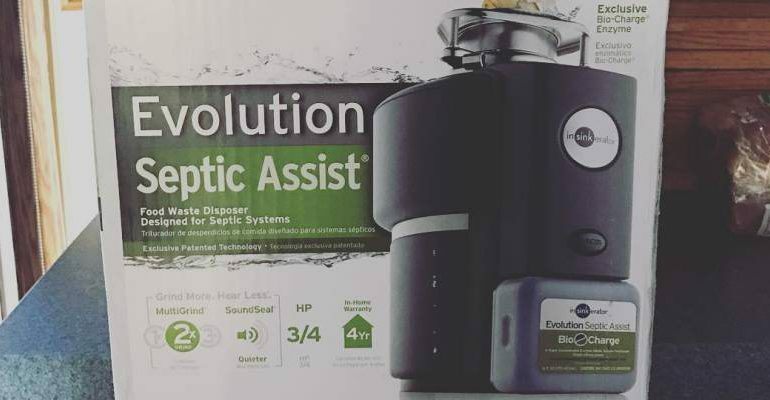 If by chance you do have to purchase a new garbage disposal, choose one with an auto-reverse mode. This feature is really worth the extra money and will help prevent your garbage disposal from becoming jammed and clogging up your pipes. You should also invest in a garbage with at least a 1 horsepower motor. A stronger motor means your waste will get ground up into smaller pieces and you’ll have to deal with less backups.